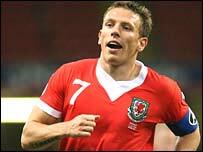 Wales captain Craig Bellamy was named Welsh footballer of the year at Tuesday's awards dinner in Cardiff's Millennium Stadium. Bellamy was unable to collect his prize as he continues to have treatment on a hernia problem, which has ruled him out of Saturday's Euro 2008 qualifier. Gareth Bale, who was also absent because of injury, took Wales' young player of the year award. Cardiff City midfielder Joe Ledley was named the Welsh clubman of the year. The 20-year-old left-sided player was an ever-present for the Coca-Cola Championship club last season, and has become an established figure in the national side. Wales manager John Toshack said: "It is a shame Craig and Gareth could not receive their awards, they have both been excellent for me and Wales over the last 12 months." Bellamy, who topped a poll of the Welsh media, took over the Wales captaincy this season from Ryan Giggs following the Manchester United winger's retirement from international football. The 28-year-old has become a key figure in helping to guide and advise the many youngsters Toshack has introduced into the squad during a difficult transitional period. But the West Ham striker will miss Saturday's qualifier with the Republic of Ireland and Wednesday's trip to Germany because of injury. Fellow award winner Bale will also miss both games as he recovers from a broken bone in his foot. Former Cardiff wing-half Alan Harrington, who won 11 caps for his country and played more than 450 games for the Bluebirds during the 60s, picked up the merit award. Referee John Gow took the long service award in recognition of his 50 years service as an official, which included time on the Football League and Uefa referees list.